Welcome back to Luca’s Friday Corner, where my hubby Luca shares all of his manly knowledge about cooking, health, and anything to do with holistic living. Now that you already know how to use a knife without injuring yourself (and if you don’t know yet, read this post), which kitchen knife would you use for the various cooking tasks? They come in different shapes and sizes, and each of them has a different scope. Often, people use only one knife to slice or chop all the foods, or even worse ‑ they pick a random one. The shapes that kitchen knives come in are different, and the table below will help you understand what they are supposed to do. Then, I’ll go into more details about the main ones – the ones that you are more likely to find in a store or in a drawer in your kitchen, leaving aside the very specialized ones. *Only if your plain blade knife isn’t sharp enough. The principal kitchen knife is the chef’s knife. The most versatile of all, it’s characterized by a tall blade (1½”/4 cm). It’s useful for moving the chopped or sliced food using it as a spatula and perfect for the “claw grip”. Its blade is 8”/20 cm long, but there are versions slightly shorter or longer. The best length is around 10-12” (25.5 ‑ 30 cm). The plain V‑shaped cutting edge makes it perfect to cut through most food; the only items to be avoided with this knife are the very delicate (and small) ones and the bread. If you try to cut a loaf of bread with it, it simply won’t work, and you’ll squish the bread. Although it’s the most versatile knife, sometimes it’s good to alternate it with another kitchen knife when the size matters. The second most important kitchen knife is the paring knife, designed just like a chef’s knife, but smaller in size. It’s suitable for all of the tasks where ease of handling is important: peeling, removing seeds, carving a radish, etc. Their size is generally between 2½ and 4” (6 and 10 cm). We find it perfect for serving avocados, cutting fruit and bell peppers, but it’s obviously good to make the “tournée” cut on vegetables such as carrots, squash, and potatoes. You’ll need a serrated blade knife if you want to cut bread or delicate produce. Although a quality sharp plain blade is always preferable, often a serrated blade will do the job better because… the plain blade isn’t sharpened enough. For example, if you want to slice a very ripe tomato, you may encounter difficulties using a plain blade because if it’s not sharp enough, it won’t cut through the peel, and you’ll very likely crush the tomato. On the other hand, a serrated blade will break through the peel with ease. The only downside is that it’s not possible to obtain the same clean and precise cut of a plain blade, as the profile of the edge of the serrated knife is rarely V-shaped – it’s asymmetrical, which means you’ll probably cut diagonally rather than perpendicularly. Bread‑like food needs exclusively a serrated knife. We own a bread knife which is brand new, still in its package, because we always find ourselves using a cheap Morrison’s First Home knife that we bought when we were living in London. I particularly love it because of how thin it is on the spine (only 0.9 mm! ), allowing us to cut crumbly foods without destroying their shape. Serrated knives are always very sharp, but if they become dull it’s impossible to sharpen them, as one would need the same tool they have been made with. Everybody seems to own a set of table knives and often uses them as a very inefficient versatile knife: very inefficient simply because they are not versatile! They are in this blog post not because they’re indispensable – not at all! It’s rather to relegate them once and for all to cutting soft cooked food like boiled potatoes and spreading butter or pate. Frankly, they are the least useful kitchen knives ever, unless you have kids: their cutting edge is in fact voluntarily dull, and they have a rounded point. How To Take Care Of Your Precious Kitchen Knives? Stainless steel, not. 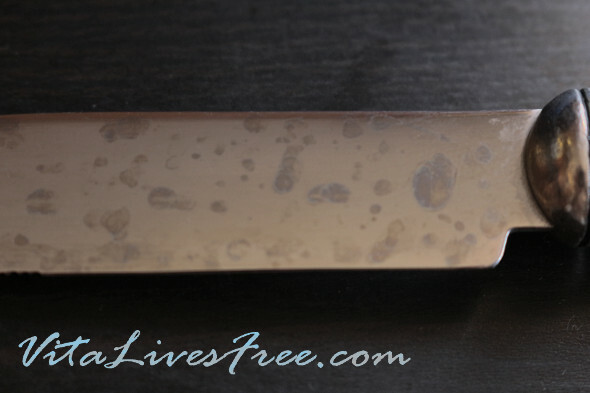 A cheap stainless steel knife can get stained like this very easily. Wash any cooking knife with hot water immediately after using it. Don’t soak or put your knives in the dishwasher as doing this will split wooden handles and dull the blade. Dry your kitchen knives carefully: most of the knives are made of high carbon stainless steel, which means that the alloy has more carbon for hardness, but still has chromium to remain shiny and nice. Even though it’s still technically stainless steel, it can get stained in the long run. Store your kitchen knives in a wooden knife block or on a magnetic knife rack to prevent damages to the cutting edge of the blade and to the point: a firm “no” to knives thrown into a drawer. An additional tip regarding the chef’s knife: this kind of knife needs to get its edge realigned with a sharpening steel (below) before each use. Most people (including me, actually) sharpen their knives too often and almost never straighten their edges. 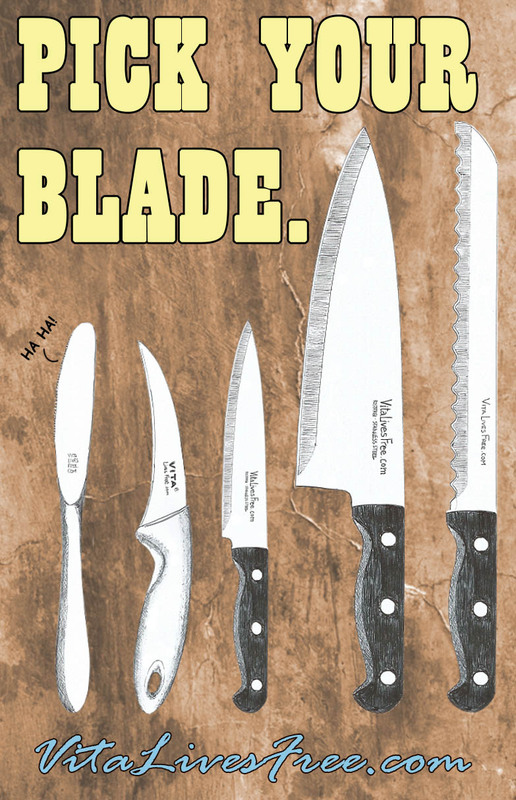 Food for thought: typically, a butcher will sharpen his knives twice a year, but hone them several times a day. First of all, you’ll need a sharpening steel. Sharpening steels would be worthy of a blog post about themselves alone, but I’ll just split them into two categories: the metal ones and the ceramic ones. Avoid the latter type – it requires skills and precision: as the ceramic is harder than the blade’s steel, it will grind the edge off. It’s also quite fragile, so dropping it quite certainly means breaking it. The more traditional steel one will just straighten the cutting edge, which typically bends when it hits the cutting board, becoming dull. That’s also why a bamboo wood cutting board is preferable, and that’s why serrated knives remain sharp for longer ‑ the serrations will prevent them from getting dull on the chopping board. Do this while resting the tip of the sharpening steel on a chopping board. It’s not how you probably saw your butcher doing it, but it’s the safest (and easiest) way: it’s never safe pointing the cutting edge towards yourself, that’s why you position the tip of the sharpening steel on a cutting board and do the same thing, but more safely. Also, professionals hone their knives with an apparent ease, but their movements are calculated and extremely precise. Click here to pin the image below for later! I hope this post is educational and helpful! I believe that if you use the proper tool while doing any job, it will become more pleasant, and of course the results will be much better. What do you think? Share your thoughts or doubts below in the comments! The knife I use all the time in the kitchen is a high quality chef knife. Thanks for a detailed guide on kitchen knives! It would be really helpful to know all the proper tools in the kitchen.